I like doing this kind of work because it gives me new insights into the thing. It is clear how there are two layers of decoration here – the original burned or impressed lines and circles, and the later carved intaglio work which partly obliterates the older lines. There is also the metal fittings which may be later again – I have ignored these on my chart. It’s also clear how the treble end of the neck has been cut down – the burned lines and circles just tail off, as do the incised lines above and below the cheekband. I wonder what is under the silver fittings. Presumably the bosses cover the little intaglio flower petals that have been added to the burned circles; but what is under the end-cap? 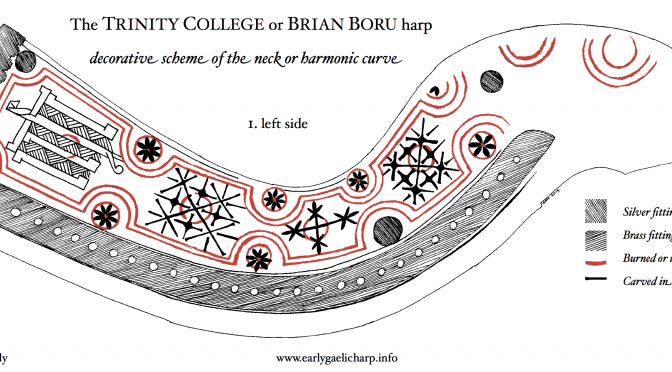 Many thanks to Digital Resources and Imaging Services, Trinity College Dublin, for supplying copies of Dr. Paul Mullarkey’s photographs of the harp. The right side was much harder to do! The designs are more complex and the underlying layer much harder to make out!